Lately I’ve been going on and on about how Denmark is quiet, peaceful and not scary at all in any way. It turns out I was lying. Even in calm old Denmark one isn’t immune from coming across indescribable horrors. I was out in town on Saturday, engaging in regular Saturday activities – loitering, meeting friends, streaking naked through the main streets of Copenhagen while screaming “God save the King!” – you know, the usual. Suddenly, a sight in a clothes store window caught my eye. There were a few mannequins inside. Something about them wasn’t…quite…right. Correct: the woman in the middle seems to be wearing a doughnut as a necklace! Horrifying, isn’t it? Also, well played, smartass – Denmark has a queen, not a king. Go get yourself a cookie! So, did the frogs eat the woman’s head? What kind of crazy is this? No wonder you’re streaking naked through Copenhagen. Rumour has it that their gaze follows you, wherever you go…even when you’re at home, miles away! Or good backup dancers, if they’re participating in “Thriller” remake! 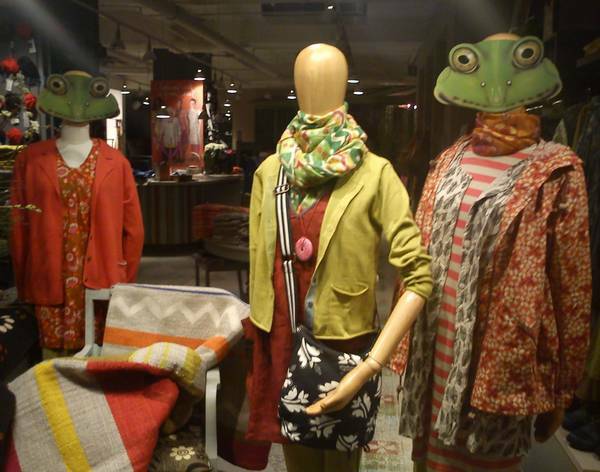 The frogs scare me a little, it looks live they devoured the other mannequin’s head. As long as you’re still streaking naked through town the general message is still intact! No streaking here, at my age it could cause serious injury to myself and psychological damage to others.